After his return from India, Bishop Melchior de Marion Brésillac founded the SMA and asked Propaganda Fide (now renamed the Congregation for the Evangelization of Peoples) to send him and his missionaries to Dahomey (today known as Bénin Republic). When Propaganda proved reluctant to send him there he agreed to go to another part of Africa and on 11 March 1859 he, along with Fr Riocreux and Brother Gratien, set sail for Freetown, Sierra Leone to meet up with Fathers Reymond and Bresson and Brother Eugene. By the end of June 1859, five of the six were buried in the soil of Freetown, as the result of a Yellow Fever epidemic. Back in Lyons, France, Fr Augustin Planque renewed the request for the SMA to be allowed go to Dahomey. In 1860, the Holy See erected the Vicariate Apostolic of Dahomey and confided it to the Society of African Missions (SMA). Fr Francesco Borghero SMA (from Italy) was named as interim Superior of the Vicariate. With Fathers Francisco Fernandez (Spanish) and Louis Edde (French), Fr Borghero sailed from Toulon on 5 January 1861. Born near Genoa in 1830, he studied for the priesthood with the Benedictines in Subiaco near Rome and was ordained – for missionary work – on 27 December 1854. After waiting a further three years to be sent ‘on the missions’, he left Subiaco. He met Bishop de Brésillac in June 1858. He spent only 4 years (1861-1865) in Africa, establishing missions in both Dahomey and western Nigeria. He travelled along the west coast from Freetown to Fernando Po. Fr Borghero was an accomplished cartographer and he mapped many parts of the west coast of Africa. He was to describe different places and standardise place names for those who came after him, be they mariners, explorers or Catholic missionaries. His Diary is an invaluable record of his missionary career (Diary of Francesco Borghero, first missionary in Dahomey 1860 -1864, translation into English, published by the SMA, Rome, 2006, 331p). In it he described the qualities and abilities a missionary should have. He needed to know, in addition to the Bible, a certain number of languages as well as know the basics of astronomy, agriculture, architecture, medicine as well as simple surgery. He should also be able to turn his hand to carpentry, blacksmith and tailor. Most of all a missionary needed to be strong enough to undertake long treks on foot as he goes about the work of evangelization. This would necessitate, on occasion, sleeping in the outdoor, enduring all that such a life would demand. His missionary vocation was founded on the belief that one must above all have the spirit of the Apostles, the love of our Saviour Jesus Christ to a heroic degree and the ardent desire to spread the Church among all peoples. 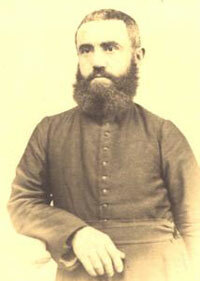 Fr Borghero died in his home village of Ronco-Scrivia on 16 October 1892. There is no doubt that Fr Borghero occupies a prominent place in the history of the SMA as well as in the Church of Benin and Nigeria. On their way to Ouidah in Dahomey, the three new SMA missionaries landed at the Canary Islands, Dakar and Freetown. There, sadly, Fr Edde died and was buried alongside Bishop de Brésillac and his four companions. Fathers Borghero and Fernandez arrived at the port of Ouidah on 18 April 1861. They were the founding missionaries of the Catholic Church on that part of the west coast of Africa. And it is that milestone that our Holy Father, Pope Benedict XVI, will celebrate during his visit to the Republic of Bénin from 18 – 20 November 2011. 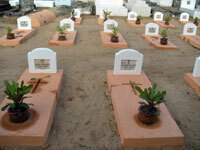 Our picture shows the graves of the early SMA missionaries buried in Agoué cemetery. Further information about the SMA and Bénin here.